Anyone got spring fever?? I know I do. Spring is that wonderful time of year when nature wakes up from hibernation and enters into an amazing state of renewal. That’s the good news. The not so good news is that every tree, flower and weed releases a ton of pollen causing seasonal allergies in nearly 50 million people. Ugh! As the pollen starts to fill the air and you start sneezing like crazy, you may be tempted to head to the local drugstore and stock up on pharmaceuticals and other allergy medications. But what if there was a more natural way to get relief? Would you be willing to try it? If you are nodding your head “yes,” I’ve got good news. There is a better way and it’s easier than you think! Allergies and hay fever, aka allergic rhinitis, occur when the immune system begins to overreact to things like pollen, animal fur, mold, dust and even certain foods. There are two types of allergies: seasonal, which occurs when plants pollinate at certain times of the year and perennial which is all year round. Spring allergies are usually due to tree pollens. Grass and weed pollens will trigger summer allergies and in the fall, allergies are typically due to ragweed. If you suffer from allergies all year long it’s probably due to allergens like dust mites and animal dander which are found indoors. Seasonal allergies are often an inherited trait. That’s right….if you have allergies, chances are one of your parents suffers from them as well. My dad and I were the unlucky ones in my family. We were both allergic to ragweed and basically lived on Benadryl and Sudafed during August and September! When you are exposed to an allergen, your immune system goes on high alert and begins to overreact to the allergen. When this happens, your body produces a chemical called histamine. The job of histamine is to help counteract the allergen but in the process it causes swelling of the nasal passages, sinuses and eyes (hello dark circles!!). The swelling is intended to keep the allergens out, but it also ends up causing us a lot of misery in the process. Symptoms vary from person to person and often will depend on what is causing the allergic reaction and how severe the allergy is. The most common symptoms include sneezing, itchy eyes, coughing, skin rashes, hives, trouble breathing and digestive disorders. Most people resort to conventional treatments for their allergies. These include antihistamines, decongestants, inhalers, skin creams, eye drops and corticosteroids. Now I know this seems like the logical thing to do, but the problem with conventional treatments is that they are only treating the symptoms. They do nothing to treat the root cause. Have you noticed that in order to keep the symptoms at bay you have to continually take the medications? That’s because these medications disturb the natural processes of your immune system and your body does not learn to adapt to the allergens. So how can you get rid of your allergies naturally? The obvious answer is to remove the allergen, but if you suffer from seasonal allergies that means you are stuck inside. Not very realistic, is it? Since this is a condition which affects the immune system, it would seem logical that strengthening our immune system would be the way to go. Makes sense, right? Well, the best way to strengthen your immune system is through diet, lifestyle and herbal remedies. You know I love to use food as medicine, so let’s start with diet. Eating an anti-inflammatory diet which includes nutrient dense foods will allow your body to repair itself so that you are better able to fight off the allergens. Fortunately, Mother Nature gives us clues as to what to eat during each season. That’s what I love about spring….seeing the bounty of colorful fruits and veggies that fill the tables at the farmers market. What better way to enjoy seasonal fresh produce! One of the best foods to eat this time of year is leafy greens. They are among the most nutrient dense plant foods and luckily they are growing in abundance right now. Leafy greens are filled with alkalizing minerals, chlorophyll and amino acids which help cleanse and energize your body. Now we all know about the benefits of spinach, kale and arugula, but have you tried dandelion greens? They are considered a bitter green so it can be an acquired taste but definitely worth a try. You can find the greens at your local store but you may actually find them growing in your own backyard. The whole plant, including the flower is completely edible! I remember picking dandelions when I was younger. We used to make necklaces with them. If only I had known that eating them could have helped my allergies!! Some other foods that help to control allergies are cruciferous vegetables, garlic, lemons, honey and apple cider vinegar. Garlic is best eaten raw versus taking garlic tablets. I hear ya…..that one is hard for me too! Perhaps drinking warm water with lemon first thing in the morning is a little more your style. This is a great way to hydrate and nourish your body. Try adding a teaspoon of apple cider vinegar to your water if you really want an extra boost. Staying hydrated during allergy season is a definite must! One of the most powerful foods against allergies is bee pollen. Consuming bee pollen is like a natural vaccine. The bees pollinate the flowers so their pollen contains local allergens. If you start taking small doses of bee pollen prior to the allergy season, you will begin to build up your immune system. You can find local bee pollen at the farmers market or at a local health food store. For those of you in Tucson, I buy my bee pollen at the Coop on 4th Ave. When you begin to introduce bee pollen into your diet, it is important to start slowly by placing 1 or 2 granules under your tongue just to make sure you do not have any kind of allergic reaction. Then you can increase by a few granules each day working up to a 1/4 teaspoon. Try that for a week. If all is well, increase to 1/2 teaspoon and try that for a week. You can also use local honey which contains bee pollen but I think the straight bee pollen is more effective. I have been taking bee pollen for years and swear by it. Two herbal remedies that are extremely effective against allergies are quercitin and stinging nettles. Quercitin is a bioflavonoid which is naturally found in cruciferous vegetables, onions, green tea, apples and citrus fruit. It has the ability to block the release of histamine without causing drowsiness. Stinging nettle leaf also helps control the release of histamine. It is best taken as a tea or in tincture form. You will often find quercitin and stinging nettles as ingredients in most herbal allergy remedies. Finally, I want to mention a couple other things that have helped me. Last year I bought an air purifier with a HEPA filter. 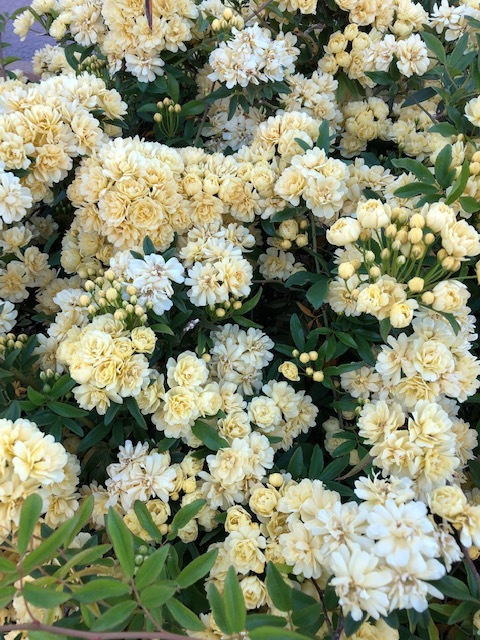 I keep it running in my house all year long and I think it has made a huge difference. The other thing that has made a big difference is not wearing my outside shoes in the house. I keep a small shoe rack in my garage and take my shoes off before I even enter the house. Not only does this cut down on pollen in my house but my floors stay a whole lot cleaner. Win win for me since mopping is not my favorite thing to do! I have suffered with allergies for most of my life. Once I realized my allergy medication was only making matters worse, I stopped taking it and started to follow the strategies I shared today. I no longer suffer with allergies so I guess you could say that I am living proof that this works! Now it’s your turn. Do you have any natural remedies that have worked for you? I would love to hear them so hit reply and let’s chat!